I remember when that terrible movie with Sarah Jessica Parker came out, the one about the mom who has a career and looks all put together and in stilettos and maybe she’s single too, I’m not sure. I won’t admit to knowing the name of the movie any more than I’ll admit to trying to watch it one day when I was pregnant. To my credit, I couldn’t get past five minutes before I got queasy (it wasn’t because of the pregnancy). I remember when I first saw the trailer. The whole thing seemed so hackneyed and first world problem-y and I didn’t care that She Does It, much less wanting to know how. I go to people’s houses and marvel at the fact that they have time to decorate for Christmas. That their nurseries are organized, that things are in shelves and boxes, that they’ve put pictures on the wall. I wonder how a friend flew across the country with a five-month-old, without any help, while extremely sleep deprived and getting over a cold. My favourite mommy blogger, who used to seem a little like me, always getting herself into these funny situations just trying to get out the door, now uses cloth diapers and bakes her own bread and her three, yep three kids’ clothes? They all match. And more and more, I feel inferior. I still haven’t done anything about getting into some kind of activity, Mommy group, something. I remind myself of a bunch of things. I tell myself I’ve made choices that compromise my time and physical ability to do anything other than play with, feed or hold my baby (and carefully now; she’s particular about sleeping positions and the sound of the keyboard wakes her up). I tell myself it won’t last forever. I tell myself that other moms don’t sit with their babies when they go to bed at 7:00 in the evening, that most people put their babies to bed and get a little time for themselves. That when Rei is a little older, not that long from now, I’ll be okay relying on the baby monitor and I won’t feel the need to be beside her every single second. I tell myself there are things like babysitters and husbands and friends who can also help. That one glorious day, she will be able to nap in her crib. Or somewhere that isn’t me. And I’ll be able to write using a real computer, instead of my phone. 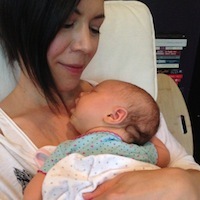 I tell myself that I’ve chosen to keep holding her all day because it seems to really, really help her nighttime sleep. That it won’t last forever. But really, it’s not about the logistics. It’s about the comparing. I never used to care what people thought of me. I was that girl in high school who chopped all her hair off to avoid looking too pretty, to seem more genuine (I know; this in itself was an act of caring). I’m still that person who tries to look a little different, that mother who dresses her baby a bit androgynously, who wants people to ask, “Boy or girl?” I deliberately choose items of clothing that don’t match. I want to be different; to demonstrate visibly that I don’t hold myself or my child to the same ideals that other people do. And then I start worrying about the comparing, and wondering what to do about it. And wondering why it’s always about what I should be doing, and not what I want to do. This bit of wisdom really helped, especially in the first month when we were just trying to survive. Sometimes I even wrote down what we did each day and showed Pete, and it actually was pretty impressive. It’s just harder now, when I feel like there’s an expectation for things to have settled out, for me to have come up for air. And that’s when I start being hard on myself again. So, I’m working on it. On appreciating all the time I spend with Rei, especially the time holding her, that I know will pass all too quickly. On getting dressed in the morning and wearing a bit of makeup, on what writing I am able to do, on the daily walks and outings I manage to fit in. And on turning the volume down on the shoulds, and up on the wants.